My morning started on the campus of the University of Louisiana. The “Home of the Ragin’ Cajuns” is known for its culture, cuisine, Southern hospitality and unique dialect of the French language. There was nowhere else I desired to be living while pursuing my degree. An online company would email me a daily inspirational quotation that would be waiting in my inbox. On this October morning, however, for the first time, I had received no such message. It struck me as odd, and I disconnected from the web and finished getting ready for class. I enjoyed my interesting courses, but my mind was dreaming about the adventure awaiting me after school that autumn day in 2000. I had been training for my pilot’s license, and I was about halfway done. The FAA requirement to fly farther than 50 nautical miles at night was one of the remaining obstacles. At dusk, my instructor met me at Lafayette’s airport, where I rented a 1985 Cessna 152 for only $44.00. Nowadays, it rents for over $100 per hour! Flying at night was quite a treat, because in Louisiana, where it’s awfully hot most of the day, the nighttime brought cooler temperatures and calmer winds. The disadvantages were the limited visibility and the increased danger associated with making an emergency landing without being able to see what was on the ground. An off-airport landing in the “Sportsman’s Paradise” could very well mean ditching into a swamp filled with stumps and alligators. I thoroughly preflighted the Cessna, and during the run-up, one magneto ran rough. We speculated a fouled spark plug because this plane had a bad habit of this during prolonged idle. I increased the throttle and leaned the mixture to burn off any oil or lead fouling. This fixed the problem, and the old airplane performed wonderfully during takeoff and climb. My instructor, a slender man who preferred aerobatics, sat next to me, observing me pilot the Cessna under the cover of darkness. Only the moon and stars illuminated the bayou beneath us. I stayed busy monitoring our heading, airspeed, altitude and other gauges. Flying was always peaceful to me, but even more so that night. The radio was silent since no other airplanes were around. As we approached our goal, the Alexandria airport, ATC cleared me for “the option.” After touching down safely, I retracted the flaps and applied full throttle and climbed us into the twilight for a cruise back home at 2,500 feet. It had been a pleasant journey so far, and nothing during the past hour had indicated anything was amiss. Our aged Cessna was well-worn from its years of use by student pilots, but it was reliable…or so I thought. All of a sudden, our engine instantly lost several hundred RPMs. The loss of thrust pulled me forward in my seat as the propeller’s hum dampened and the yoke yielded tension. Without any engine power, our injured bird would glide about 500 feet per minute, which would mean landing within five minutes—whether we wanted to or not, and the airport was still too far away if we lost total power. My instructor immediately grabbed the yoke and banked us to a heading for Bunkie, and simultaneously informed ATC. We went through our emergency checklist to restore power, but nothing worked. Being a pilot meshed naturally with my calm demeanor. I was never one to get rattled in tense situations, yet I still understood the urgency of properly handling an in-flight emergency. I had trained for engine failures, but dealing with a partial power loss was something new to me, and the response to it wasn’t as clear. With the engine still running, we had more options to consider—at least for the time being. I began scanning for a suitable place to land. All I saw was darkness from the wetlands below, with one exception. The interstate looked like one long, beautifully paved runway inviting me to land. “We can put ’er down on I-49,” I suggested. “Yeah, and hope an 18-wheeler sees us and doesn’t drive over us,” he replied. That wasn’t a pleasant thought, and it reminded me of a court case where a small airplane had landed on an interstate. When a driver saw the plane in her rearview mirror, she panicked and caused a collision by slamming on the brakes. Since there were no services at Bunkie and cell phones were not common, I wondered what our plan would be after landing there—if we even made it there. “We’ll use a payphone to call someone to pick us up,” the instructor said. We discussed our options: (1) divert to Bunkie, knowing that it would be approximately two and a half hours before someone picked us up and drove us back to Lafayette; (2) return home since the engine still droned at a steady, flyable pace, and we’d be landing within 45 minutes; or (3) make a precautionary off-airport landing while we still had power—this being our least desired plan. “Get-there-itis” coupled with our confidence that the engine would stay alive, we navigated home and ensured our path took us over the freeway. ATC transferred us to Lafayette’s frequency, where the controller had volunteered to stay past closing time to be present for our arrival. The familiarity of Lafayette’s well-lit runway welcoming us to land was a relief. I applied full flaps and made my approach, as I had done many times before. The tires chirped on landing and the once-palpable apprehension in the cockpit dissipated now that we were back on terra firma. “Glad ya’ll made it back safely,” the controller announced. I glanced at my watch. It was 10:15 p.m. I taxied the Cessna to the apron, and we completed a post-flight inspection. The cause of the malfunction remained a mystery. During my drive back to campus, I reflected on what had just happened. I felt proud I had accomplished my FAA requirement, gained valuable experience and that we had landed safely. But after 17 years as a pilot, I know it is better to be on the ground wishing you were in the air than in the air wishing you were on the ground. Thus, when a similar incident happened while piloting my Cessna Cardinal at night over the New Mexico desert in August 2015, I recalled this bayou flight. Instead of continuing to my destination, I landed at the nearest airport. Tucker Axum is the winner of the 2017 James Patterson MasterClass coauthor competition. More info at www.tuckeraxum.com. 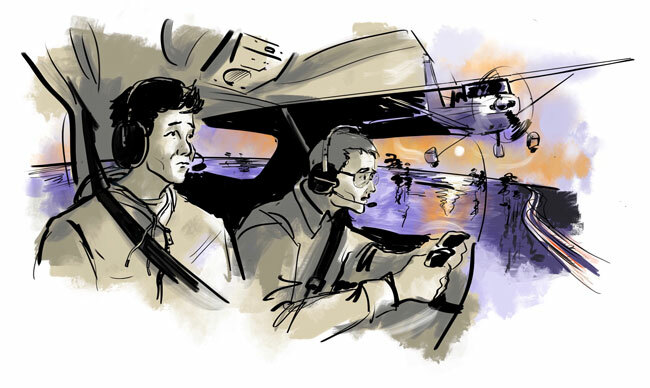 Have you had a close call or a cool aviation experience that left a lasting impression? We’d love to share your story in the magazine! We’re looking for stories that are between 1,100 and 1,500 words long that tell a great story. If you’re interested, you can always write us a note outlining your experience and we’ll get back to you right away. The pay is small potatoes, $101, but if your story is chosen, you’ll get to work with our great illustrator Gabriel Campanario and have him bring your memory to life. Email us (sorry, no phone calls or snail mail) at [email protected] and put Lessons Learned Submission in the subject line. Did you miss our last installment of Lessons Learned About Flying? Check out the archive now!